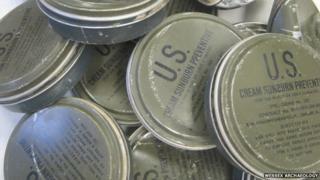 Image caption The tins of US Army sun cream are labelled for use in "hot or cold climates"
US Army sun cream and tins of bacon are among the finds on Salisbury Plain revealed by archaeologists, to mark US Independence Day. Wessex Archaeology, based on the plain, said various US-issued provisions had been found in recent years. Among the finds were tins of cooking oil, bottles of sauce and "even what appeared to be a block of lard". A group spokeswoman said: "The state of preservation of the provisions shows how well made they were." The Wiltshire plain has been used as a training ground by the British military since the early 20th Century. It also provided a training area for US troops preparing for the invasion of Nazi-occupied Europe during World War Two. "The military has been on Salisbury Plain for decades so it's not been ploughed up or disturbed by developers," said Matt Leivers, from Wessex Archaeology. Among the other finds unearthed on the plain were spoons and plates and bottles of Camp coffee. Speaking about the "cream sunburn preventive", which is labelled for use in "hot or cold climates", a Wessex Archaeology spokesman said: "It was a rare hoard of 16 tins of US Army sun cream - still with the contents intact. "It's evidence of US military presence on Salisbury Plain and the surrounding area. "Sadly, there were no contents left in the tins of sliced bacon." The finds have been transferred to the Salisbury Museum.